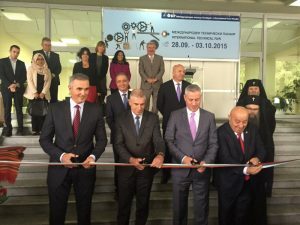 “The Ministry of Economy will continue to place strong emphasis on improving the business environment in Bulgaria; will support and promote all initiatives that are of the interest – intensification of cooperation in the field of innovation, research and investment.” This was stated by Minister of Economy Bozidar Lukarski at the opening of the 71 th edition of the International Fair – Plovdiv. He also said that the opening of such a large trade and economic forum, is always associated with ambitious business plans and expectations for intensive contacts. “We all know that technical fair is known for innovation, because that is described as the largest technology meets on the Balkans. And innovations are seen as the most important factor for increasing productivity and competitiveness of the Bulgarian economy, “said Minister Lukarski. This year on the International Fair- Plovdiv will participate more than 800 companies from 35 countries and around 50,000 visitors are expected to visit the prestigious trade show. There can get acquainted with the latest achievements of world`s leaders in engineering, construction, electronics, automotive, information technology, software, and many more. Lukarski pointed that for the first time this year, the International Fair in Plovdiv will be a specialized exhibition, which will present the latest innovations in the construction industry. “Growing business in construction is a signal that the economic crisis, that was in recent years the industry, starts to go away,” he also said. Minister Lukarski wished all the participants and guests during this forum to have a fruitful business meetings and many new suggestions and ideas.